Well, friends, after ranting about things that annoy me (and then get deleted) for the past day or two, I thought I'd put on my happy face and share what may be the cutest website ever with you. Everyone likes stuffed animals, right? Click on the picture to see a larger screen shot. Brazilian designers Fernando and Humberto Campana create some seriously wacky furnishings and accessories, and you can't help but giggle while watching teddy bears get airlifted from vending machines to join their fuzzy wuzzy brothers and sisters in chair land. I know they're silly, but they just make smile. Ouch. That hurts. I kind of wish I had a kid so I could justify having one of those alligator chairs for little him or her. I'm not sure how I would feel about buying one for myself... Oh, who cares. I want one. The panda and dolphin chairs are available through Moss, also seen at Crooked Brains. The brothers Campana do make slightly more sophisticated furnishings as well, most of which are material-driven. The table on the left is made from plastic drain covers while the colorful table tops below are strung with lawn furniture rope cord. On their awesome website, every project is accompanied by a visual story, and the graphic design is pretty fantastic and extremely intricate. 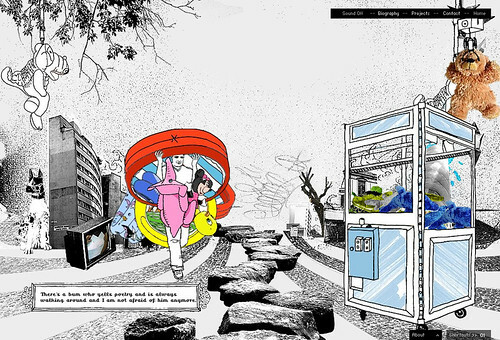 For example, the animation accompanying the "Sushi" pieces below features a whirling pinwheel of tables set on a psychedelic background. Trippy, dude. I think that couch is not too shabby for something made of carpet padding and styrofoam mats. What do you guys think? On the left is the "Anemone" chair (aka, "The Bird's Nest") made of clear garden hoses and on the right is the "Boa" sofa made of interconnected velvet sausage-like strands. Velvet sausage. Yum. Humberto started out with a law degree, while Fernando majored in architecture. Whatever you must do to earn a few feathers in your cap, I guess. They're kind of adorable. I want to squeeze little Fernando's cheeks, and feed Humberto a sandwich. Isn't my good side nice?